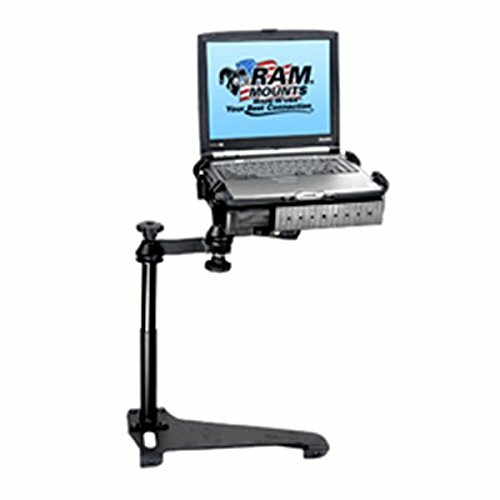 RAM No-Drill laptop stand system installs quickly, easily and securely into the specified vehicle using the existing hardware of the passenger side seat rails. The system includes the vehicle specific base, RAM Tele-Pole for vertical adjustment, RAM double swing arm system for horizontal adjustment, and the RAM universal Tough Tray for laptops 12-17" wide. This system provides a stable platform for laptop use by the driver or passenger. The RAM Tough Tray includes four side clamping adjustable rubber coated fingers to accommodate many different sizes and configurations of laptops. The edges of the tray come predrilled with holes to accommodate the mounting of other RAM systems to mount GPS, cell phones, PDA etc. This system is compatible with the following vehicles: Honda Accord (2004-2007). Manufactured in the USA and comes with RAM Lifetime Warranty. RAM Mounts (RAM-VBD-122-NT) Universal Drill-Down Laptop Mount. Swing Arm Connects to 2.5" Diameter Ball Base.